Welcome to the second installment of the Girardian Virtual Bible Study. You can join Lindsey and Adam on the live Bible Study with your comments and questions on the Raven Foundation Facebook page every Wednesday morning at 10:00 am Central, 8:00 am Pacific. If you can’t make the live show, you can watch the recording or listen to the MP3 the following day here on the Raven Review. For more on the work of René Girard and the Bible, we highly recommend Paul Nuechterlein’s website Girardian Reflections on the Lectionary. 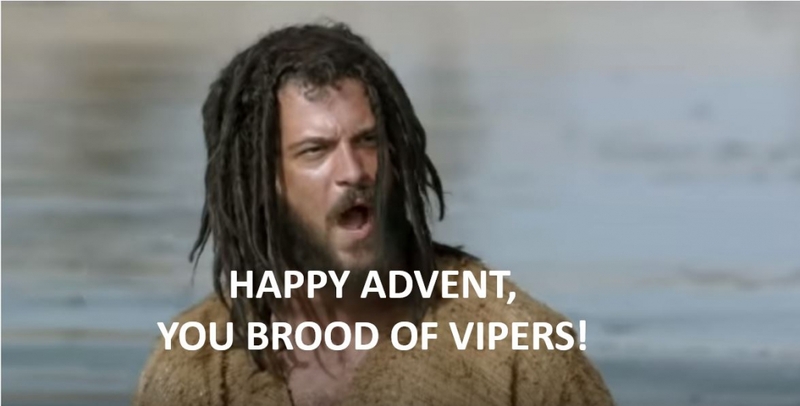 Hey, you brood of vipers! Ouch. That’s kind of a rough way to start a call to repentance, don’t you think? John the Baptist could have been a little more gentle, right? Well, let’s take the Second Sunday of Advent from the beginning of the Gospel passage of Luke 3:1-17. First, Luke starts this passage with historical context. He names names. Emperor Tiberius. Pontius Pilate. Herod. Philip. Lysanias. Annas. Caiaphas. All of these people were big deals back in the day. Especially Emperor Tiberius. Why does Luke go through those names? Well, you expect God to show up in the powerful rulers. In fact, Emperors were called the Son of God. And the way the Roman Empire brought peace was through the sword. “Peace through strength” was the Roman military propaganda slogan. If you wanted to find God in the world, you would look to those in power. But the Gospels flip our expectations. The word of God didn’t come to any of those powerful people. It came to John the Baptist. A strange dude hanging out in the wilderness. He told people to repent and receive the forgiveness of sins. And here we have our first issue with the word “repent.” We usually think of it as some moral issue. I’ve sinned and so I need to repent. There may be some of that going on with this word, but what it really means is simply, “change your mind.” Repenting is to change your mind about God. God is not “out to get you.” We need to change our mind about that. All God wants is for us to receive forgiveness. God is not like the powerful rulers who bring “peace through strength.” That’s not peace. Look to the God who shows up in the most unexpected places and in the most unexpected people. Rene Girard says that this passage is a sign of “undifferentiation.” That’s a big word! Basically it means “sameness” or “equality.” The valleys and mountains and hills will be “undifferentiated,” or made to be on the same level. We tend to think this sameness and equality is a fundamentally good thing. And it is! It seems to be what God is doing in the world. But there is a BIG danger that Girard warns about. When we are undifferentiated, when we are all on the same level, there is the opportunity to love, but there is also a natural tendency to fall into rivalry. When we desire the same thing and we cannot share it, or we refuse to share, we will fall into rivalry. Undifferentiation can foster this in our relationships. The leveling of the land in Isaiah – filling in the valleys and making the mountains low – is a metaphoric invocation of justice – uplifting the poor and humbling the mighty. But as we learn from the wisdom of Facebook memes, for those who have always been on top, equality can seem like oppression. The mighty resist being humbled… and many are reluctant and resistant to acknowledging privilege. Girard’s critique of undifferentiation helps us understand why social justice movements and emerging equality are so often met with resistance and backlash. Yet, though equality is necessary to prepare the way of the Lord, it is not the end goal. We must recognize that all people have equal value and dignity – that no one is inherently higher or lower than anyone else – in order to pave the way in our hearts for the Lord. Equality is not the ultimate goal; love is. To prepare the way of the Lord is to humble ourselves and uplift the vulnerable and oppressed so that true compassion and real relationship can thrive within and among us. That is how Christ enthrones himself within our hearts. Girard warns that equality may lead to rivalry, but it is necessary to pave the way for Love. They want to know how they can stop being a brood of vipers! John tells them to share of what they have with others and to stop acting in unjust ways. Did you notice that passage from Isaiah ended with “all flesh shall see the salvation of God”? But what about this passage that the chaff will burn in unquenchable fire? How do we make sense of this? Have you ever felt…chaffy? You know, like you have some hard edges? I have those edges. Those edges are the chaff that needs to be burned away. This is how the Bible often talks about fire. In the Hebrew Bible reading for this Sunday, Malachi 3:1-4, speaks of “refiner’s fire.” Fire has a purpose. It’s not to be painful, although it can be. The ultimate goal is to purify. We may walk through the fire, but in the end, all flesh will see the salvation of God. Even those of us who act like a brood of vipers. Image: Screenshot from Youtube modified.